Very often I’ll get the question on how I go about establishing test shoot with models. Do I contact them directly? Do I go through an agency? Quite honestly I’ve never dealt with a modeling agency, mostly because I was unaware that reaching out to inquire about working with someone from their roster was a thing but apparently you can. It’s certainly an approach I’ll hold on to for future shoots but for the most part, 95% of the portraits I’ve taken have been from people I’ve reached out to via Instagram. “How so?” Well, for me, there's definitely much more than the obvious. Before anything, I kinda want you to envision this scenario a bit. Imagine you've worked as a construction worker for the majority of the time you've been in the workforce and after much pondering, you're hoping to branch out and explore other career opportunities to be lets say, a cook. So the question is, has this newly found possible profession been something you've actively been working on the side to get to a level where you're comfortable applying for a job and you have the basic skills down? Or is it a skill set that's still in its untimely stages but you're just as eager to polish them to a point where you could live off of them? What does any of this have to do with portraits or reaching out to people on Instagram? Well, I bring this up because the instance I discovered that taking portraits was where I seemed to obtain the greatest satisfaction within everything I photographed, that’s the moment I began exhausting the patience of friends to serve as models. This very act in return provided me with the opening to create work which would serve to attract the people I would later reach out to. The way I saw it, I couldn’t be livid about anyone not wanting to collaborate with me on a shoot if when they saw any of my photos, there was complete and total lack of portraits and now all of a sudden I’m reaching out to them without having anything visual to incentivize them to say “yes!" I’m not saying you can’t reach out to people with the intent to shoot portraits if you don’t have any work to show for it already but I feel as though it helped me tremendously when people saw I was already doing it because it provided them with an idea of what our collaboration could look like. In addition to making sure I dedicated time to creating a backlog of portrait work, I wanted to share a few other tips/guiding principles that have kinda helped me along the way in working with some pretty awesome people who I probably would have never connected with otherwise had it not been for Instagram. Think of Instagram’s Explore page as your best friend. Gone on the days where it was endlessly cluttered with vapid imagery of puppies and rainbows. The algorithm in it since then has evolved drastically and it’s by far been the #1 place within Instagram that I’m constantly browsing through. Intriguing and fascinating people pop up for me a lot and the bonus to this has been that the majority of them happen to reside right here in New York or in some neighboring town. So basically, don’t overlook it because from what I understand, the content that pops in the Explore pages has some correlation to the people you Follow. Please don’t be the type of photographer that reaches out to people with a bland line such as “Let’s takes pictures over the weekend.” Not only does it come across creepy but it’s unprofessional. The ideal thing to do and have even before you’ve reached out is to have a detailed vision for the shoot that clarifies your intentions. Spontaneity during a shoot is one thing but not having at least a concept in mind is another. When people see that you’ve already constructed a vision for which you would love for them to be a vital part of, it’ll just make it seem like you have your stuff together. To me, having a concept of what I want to shoot has always served me well because in the end, you have to remember that as a photographer, it’s your vision the reason people will want to hire you for. I have a tendency to go back and visually explore a place I’ve popped-in to by using its geotagged location. If I loved a place, say a coffee shop, then there’s a chance already that anyone else who I discover through this geotag and who frequents it as well, loves it too, so right there, I can already start a conversation with someone based on a placed we’ve both been to. Instagram Direct Message can reinforce your relationship with current followers, while giving you opportunities to meet new people. The one thing I really never do is assume I can reach out to anyone via Direct Message whenever I want. There’s honestly nothing stopping you from doing so, unless they’ve blocked you for some reason, but I generally always comment on one of the person’s photos asking them if it’s ok for me to reach out to them via Direct Message regarding the possibility of working together on something. For some people, the whole concept of meeting another person who you've befriended online may still sound creepy, perhaps because they're still thinking back to those creepy chatroom AOL days but I've had nothing but terrific experiences with people I've met. In fact, the majority of them I still keep in contact with on a regular basis. It's generally a good sign when you can establish a friendship with a person that extends far beyond the initial reason you reached out to them in the first place. When we’re no longer being challenged or when we have become used to the work we are doing, it’s a sign that we are not growing creatively, personally or emotionally. We’ve drained the life out of ourselves. I’m still attempting to process Anthony Bourdain’s passing. We hear news about celebrity deaths all the time and I’m not saying these are reports we should be numb to it but the initial reaction is still of disbelief. We’re spectators to the glorious lives these people live as they’re flashed on every media outlet like an ongoing slideshow but behind all that we’re never truly informed on the intricate mechanics of what we’re seeing. I’ve written before how much I idolized Bourdain. 6 years later that admiration remains which is why his unexpected death made me reflect on what a lot of his work revolved around: everybody has a story based off their life experiences of which we may know nothing about. We can only decode so much from the outside. We’ve all familiar with the saying that “it’s lonely at the top”. I assume while you’re up there, the desire to reveal the best image of yourself, to stay liked, to be a role model puts an insane amount of pressure on anyone. A feeling which very often goes unspoken by the person living it. Who knows if this was the case for Bourdain; he certainly didn’t seem the type to have given this celebrity quandary much thought but we’ll never know. I’ve read all his books, I’ve seen every single one of his show episodes, I’ve followed every project he was involved in, including the very ambitious Bourdain Market which was set to open in New York but unfortunately the entire project was axed. I’ve trolled Bourdain’s work because I cared so much in listening to his perspective on life matters that extended far beyond what he was known for. While food might have been the entry way in which he gained access into people’s lives, it was more about than that. It’s that “more” element which enabled him to shine. You can’t fake being interested in people. Either you are or you’re not and that’s what he was all about. As Helen Brosner said in a recent New Yorker piece, “Bourdain felt like your brother, your rad uncle, your impossibly cool dad—your realest, smartest friend, who wandered outside after beers at the local one night and ended up in front of some TV cameras and decided to stay there.” This is what made him so relatable. He was highly thought of and yet he never seemed as thought he thought highly of himself. What’s not to love about a guy like that! Through his expression you can read the pain he had endured to reach the well-deserved celebrity position he was at. He lived and suffered but inspired as well. 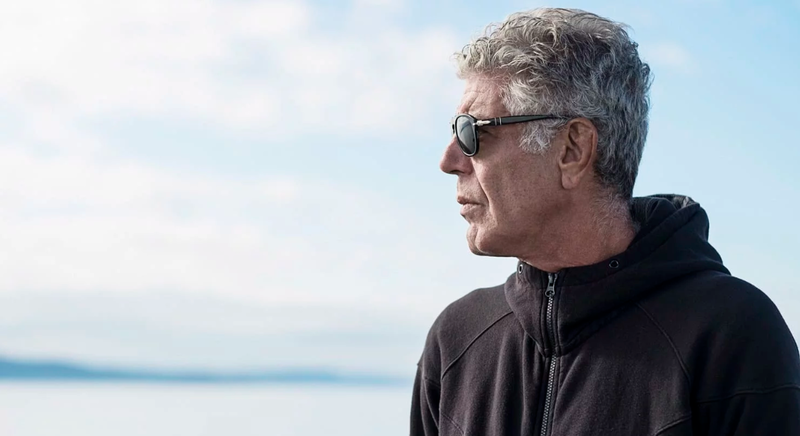 Without suffering and the occasional doubts, the mind will have a tendency to rest on cliches and stay there and there was nothing Bourdain despised more than that. We may never have the opportunity to travel as much as his sough-after career allowed him to but I’ve learned traveling doesn’t always have to entail far long journeys. I’m fortunate to live in one of the most diverse cities in the world and not a day goes by where I don’t encounter people with different customs, different ideologies, different life perspectives and it’s those differences that Bourdain taught us to embrace. I’m extreme sadden by Bourdain’s passing just like any other fan. He’s the reason I enrolled my son in Jiu Jitsu. He’s the reason I bought my first ever pair of Clarks Suede Desert Boots, he’s the reason I became a voracious reader, he’s the reason I love to write about what I shoot because I was inspired the way in which he narrates his travels experiences in his shows. To do what he did required a lot of toughness but also a constant connection to reality. To me there was no one else more real than him and that’s how I’ll always remember. Speak your mind, stand by it and stay curious. If you admire him as much as we all do, I think you'd appreciate this beautiful Life in Pictures CNN composed of his life's work. When Callie mentioned she had never walked the Williamsburg Bridge the revelation alone served as the perfect reason as to why I felted obligated to encourage the trek up despite the frigid weather that morning because once you're up there you quickly begin realizing what took you so long to visit. As we made our way up, I pulled out the Sony RX100 V I happen to be carrying along with me and shot some video along the way to serve as a great reminder how fun it is to work with Callie.